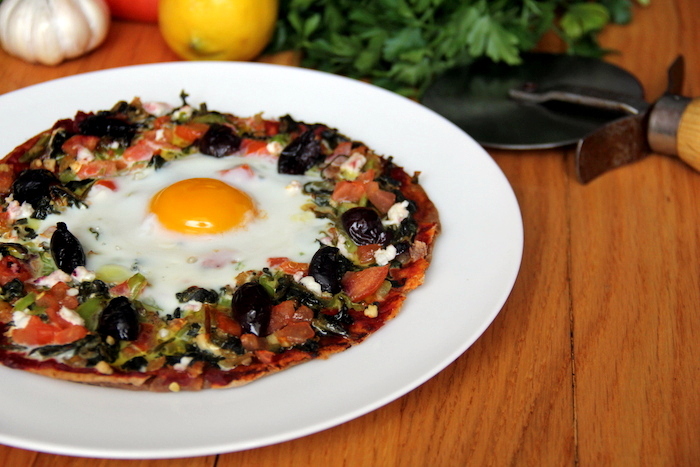 I’m a huge fan of savory breakfasts, and enjoyed them more often than not when growing up. 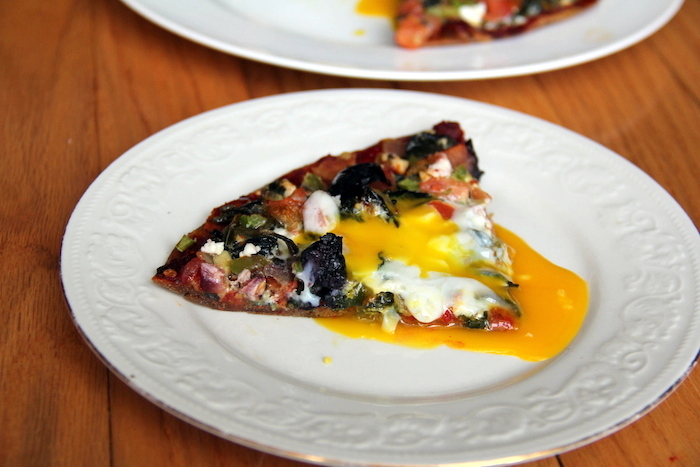 One of my father’s go-to breakfast on the weekends was a breakfast pizza of sorts. 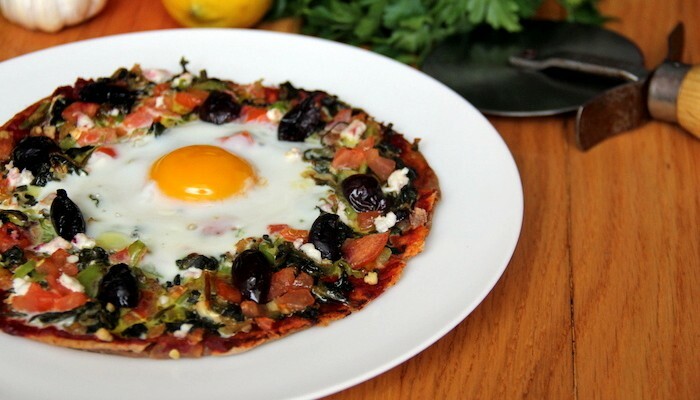 He takes a tortilla, tops it with leftover roasted veggies, tomato, and cooks until crisp, cracking an egg on top for the last 5 minutes for some extra protein and bulk. The result is just as tasty as it is quick to put together. 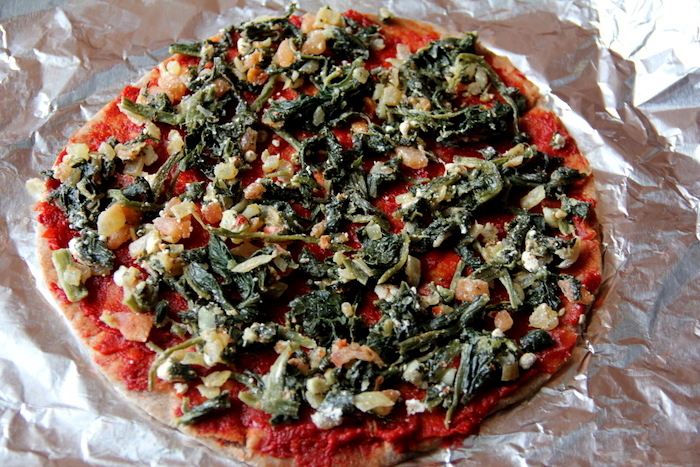 And, of course, you can change up the toppings as you would for any regular homemade pizza. Experiment with different cheeses, veggies, and herbs. Enjoy! Brush both sides of the tortilla completely with 1 tablespoon of olive oil. Place on aluminum foil. Spread a thin layer of the tomato paste across the top of the tortilla so it evenly coats the entire surface. Next, evenly distribute the onion, peppers, tomato and garlic. Season with salt and pepper. Distribute the spinach evenly across the top and drizzle with the remaining tablespoon of olive oil. Fold the edges of the aluminum foil over the edges to protect from burning. 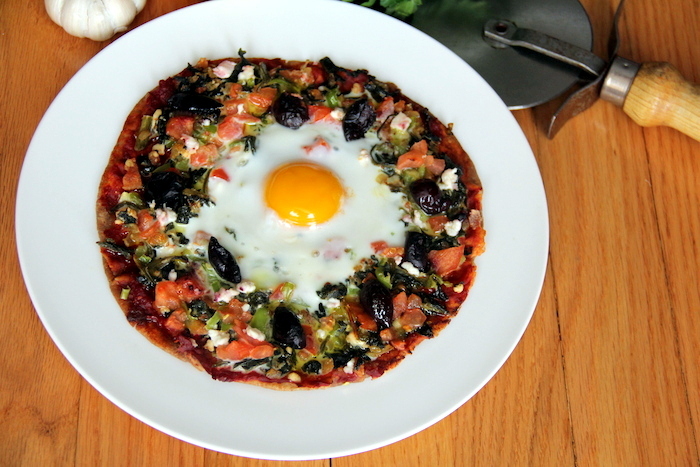 Cook for 10 minutes and then crack an egg in the center, add olives, and sprinkle with cheese. Cook for another 5-8 minutes or until the egg reaches the finish you want. Serve and enjoy! Share if you like. 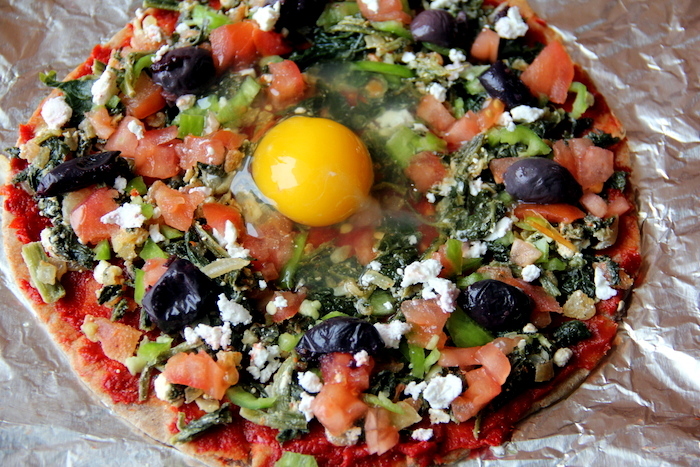 This entry was tagged breakfast pizza, breakfast pizza recipe, cheese, cheese recipes, detox recipes, easy healthy recipes, feta cheese recipes, getarian, goat cheese recipes, good vegetarian recipes, great vegetarian recipes, healthy, healthy breakfast recipes, healthy dinner recipes, healthy food recipes, healthy pizza, healthy pizza recipes, healthy recipes, heart healthy recipes, how to become a vegetarian, pizza, quick vegetarian recipes, simple vegetarian recipes, veggie recipes. Bookmark the permalink.